Updated at 6:46 p.m. on Tuesday, August 7, 2018, with more information. 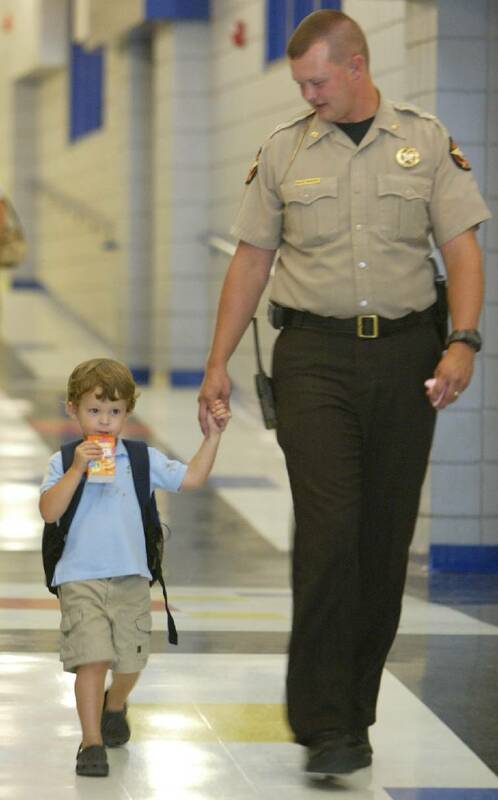 Times Free Press file photo/ Major Tommy Bradford walks with his son, Aidan Bradford, after finishing his first day of Pre-Kindergarten class in August 2006. A man and woman being chased by several law enforcement agencies hit and injured Dade County Sheriff's Office Major Tommy Bradford this afternoon. 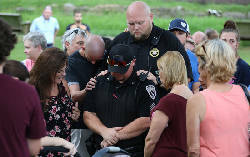 Dade County Emergency Services Director Alex Case said Bradford lay down a spike strip on U.S. Highway 11 South and Cedar Lane, near the county's soccer fields. Passing through, the driver hit Bradford on the side of the road. Case said Bradford lost his left leg below the knee. A response team treated him at the scene, before he was airlifted to Erlanger Health Center. "He talked to us," Case told the Times Free Press. "He knew who we were. Now, he's in God's hands with the doctors. His wife's up there. The sheriff's up there. All his family is up there at Erlanger." He added: "Say a prayer for our brother. He's a good friend of ours. We just ask our community for thoughts and prayers for Tommy, (his wife) Mary Ann and their children." The chase began in Fort Payne, Ala., with the Alabama State Patrol helping. Dade County's 911 center received a request for help as the car approached the state line around 2:01 p.m., Case said. Dade County Sgt. Chip Burrow picked up the vehicle. After hitting Bradford, the driver of the car continued north, toward the center of Dade County. Deputies stopped the car around the old courthouse in Trenton's main square. Case said the man was arrested, but the woman had a seizure and received medical treatment. Fort Payne, Alabama, police, however did not mention a male suspect. Chief Randy Bynum said the chase began when someone reported a theft of property. The person said the female walked into a carport, picked something up and left. The suspect's vehicle was spotted by an officer who attempted to stop the vehicle but was unsuccessful. The suspect continued to drive on Greenhill Boulevard and then to Highway 11 north to outside city limits. Several police agencies joined in the pursuit that eventually crossed into the state of Georgia. The suspect and vehicle were apprehended at the Dade County Courthouse square. Laura Leeann Wooten, 35, of Dekalb County, was taken into custody. A spokesperson for the Georgia State Patrol, which is investigating the crash that injured Bradford, did not immediately return an email.